please contact me by e-mail at littlejewelbabies@yahoo.com. Babies can be paid for immediately with PayPal here in this site, or you can send a money order or certified check by mail. No personal checks. Payment must be received within 7 days when paying by money order or certified check. If not received within that time frame baby will be relisted for sale. Just e-mail me if you would like to send payment by mail so I can remove the baby from site so others cannot buy him/her while I am waiting for mail payment to be received. Special note: International orders MUST be paid through PayPal only. Also, international buyers shipping charges do NOT cover duty/customs or any fees incurred in other countries. These are the sole responsibility of you, the buyer! Please know what your country allows before you purchase!!! The shipping cost does cover insurance if it is available in your country. No sale is ever final. If you are unhappy for any reason, please e-mail me for a full refund, minus shipping charges. 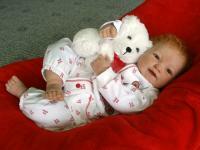 Refund will be given when baby is received back and in the condition that you received baby in the first place. So please ask any questions first before buying regarding that specific baby so you will know what you are purchasing. All reborn babies are made in a smoke and pet free environment. 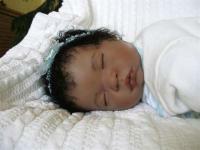 Each precious 'reborn/newborn' baby is given an individual and unique personality. For the doll that comes as a play doll it is taken apart and all factory paint and hairlines are removed and this starts the 'reborning' process. 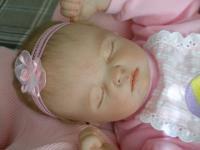 The dolls that come as a blank kit, no paint, get the 'newborn' process done since they don't have to be reborn. Each baby will be totally painted on the outside vinyl with Genesis Heat Set Oil Paints. These paints are permanent so your new baby will stay as beautiful as the day their process was done. Once all the detail work is done I add Genesis Heat Set Matte Varnish to add extra protection of the detailed painting and it adds some skin texture and keeps the vinyl from ever becoming shiny. I use premium mo-hair that is so soft and realistic looking on all the babies. All babies with open eyes are given new realistic eyes. 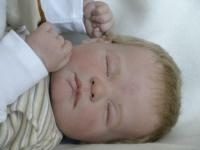 Each baby receives a new sewn weighted jointed body that makes them very poseable and cuddly just like a real baby would be. Even their heads are weighted so you have to support their heads when you pick them up. Detail by detail the babies are 'reborn/newborn' into an adorable "Collectible Forever Heirloom Baby" from the Little Jewel Babies Nursery.